JustType online website builder has been fundamental in allowing a Kent-based PR agency to develop a website design business to complement their traditional press activities. 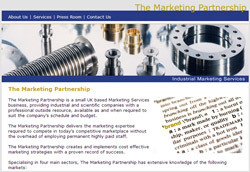 The Marketing Partnership is a small PR agency based in Bearsted, Kent that manages the press and marketing activities for a number of engineering and technical-based companies throughout the UK. Even though they specialise in PR, their clients often look to them to supply the entire range of creative services, including literature design, websites and advertising copy. Some of these additional services are sub-contracted out. It was when they wanted to expand their business into other areas that The Marketing Partnership came across JustType. The company decided that an on-line website building tool would be a great way for them to expand their website design service to smaller businesses without the overhead of complex design software. They could also keep the entire design process in-house and therefore maximise profits from each project. The own-branding of JustType was an important consideration for the company as they were keen to set their own pricing and not necessarily reveal to their clients that the websites were being built from a template-based on-line design tool. The adoption of JustType as their preferred website design tool coincided with The Marketing Partnership wanting to upgrade their own site. They were so happy with the initial results they were getting that they replaced their old site with a new one created with JustType. As with any website design business SEO is vitally important to ensure their sites get good search engine rankings. JustType provides all the necessary fields and access to Meta tags to ensure flexible configuration for SEO.